Frances Fulton was a teacher at Hwa Nan College in Foochow, China during the 1930s. 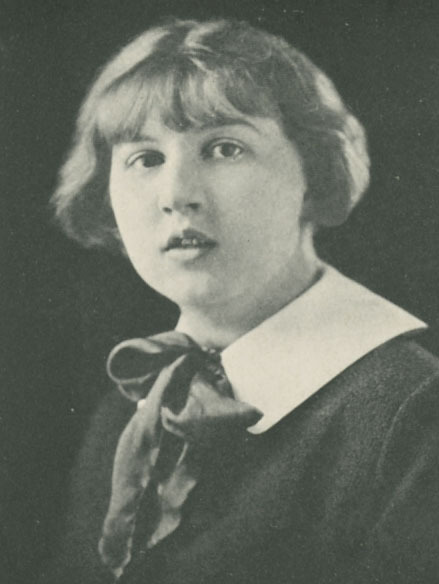 Alumnae Quarterly (AQ) February 1940: "Frances Fulton sails February 24 for Lima, Peru, where she will teach science and math in the Lima Girls’ High School." AQ May 1947: "Frances Fulton has gone to China to teach in Hwa Nan College, Foochow. Fukien Province. She expects to be there for at least five years. She took her cello with her and hopes to continue her enjoyment of it in China." Frances Fulton wrote a Christmas letter from China, having returned on the third trip of the Marine Lynx with some hundreds of others in crowded hatches. Frances had been away from China eight years, and her first impression was one of the sameness of China. On closer examination, however, she found that there were many changes. The educated group and the once moderately comfortable middle class are shabby. The college’s greatest need is buildings. The largest buildings are in ruins and they have more than twice the enrollment of pre-war days. Frances wrote from Peiping where she has been studying Mandarin which she thinks must be the hardest language on earth. However, she is glad for the opportunity and hopes to put it to good use when she returns to Foochow. AQ February 1948: "Frances says that in spite of what our newspapers print about China, there is much that is constructive going on. The people are going about their daily work, the schools are overflowing, the churches have full programs and full houses, and life in general seems to be going on in a normal way. She believes China will make interesting history in the next few years." AQ November 1949: "A long letter reached us from Frances Fulton from Hwa Nan College at Foochow, Fukien, China, where she is one of the music faculty. At the time of writing in May, the situation in China was tense, but college was to continue on normal schedule, come what may. She said that communications might become difficult, but to continue writing to her because it meant so much." AQ November 1951: "Frances Fulton’s plans include the study of Korean at Yale, then off to Korea, perhaps." AQ November 1952: "Frances Fulton sailed September 26 for Japan. Her eventual destination is Ewha Womens University, now in Pusan; but until she is permitted to enter Korea she will be at the Seiwa Training School, near Kobe Japan." AQ February 1953: "Frances Fulton describes Ewha Unversity and the difficulties of teaching and living there. “The pianos! Ewha had 60 in the prewar days. Now it is down to seven and none of those have all the hammers and strings. The practice rooms are board sheds about 9x12 with dirt floors and canvas roofs. The pianos are up on board platforms to keep them from sinking into the mud, so the chairs must be propped up too. Each lesson becomes a balancing act…That Ewha has been able to keep going at all, and has 1300 students in its various colleges is nothing short of amazing…I have covered the floor of my room with heavy paper pasted down at the edges, and with matting so the wind no longer whistles up between the boards and blows out the oil stove. We can buy the root vegetables, spinach, Chinese cabbage, carrots, apples, pears, persimmons and some beef and excellent fish on the local market." 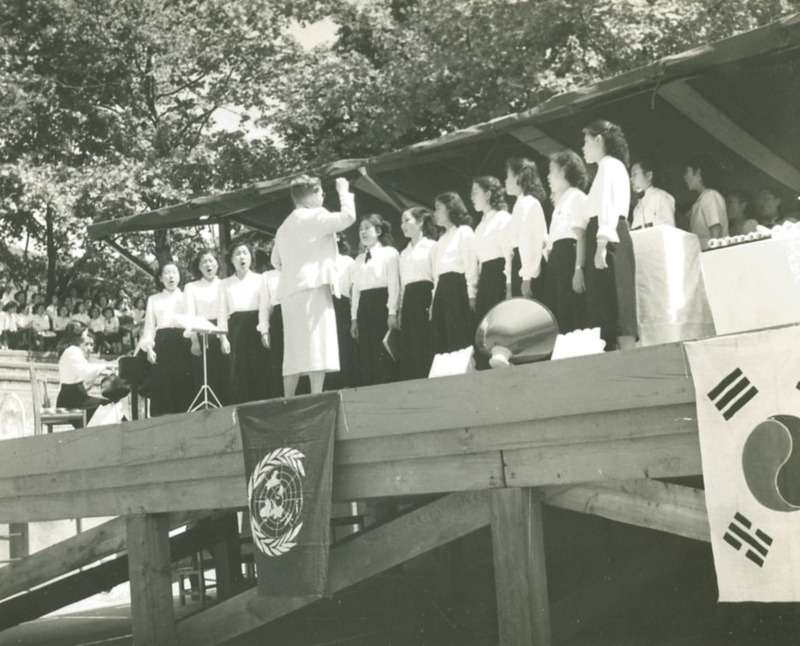 Frances, conducting the women's choir at Ewha University. That is what I am looking for about the great information. Elisabeth Scott Stam '28 Part 1.